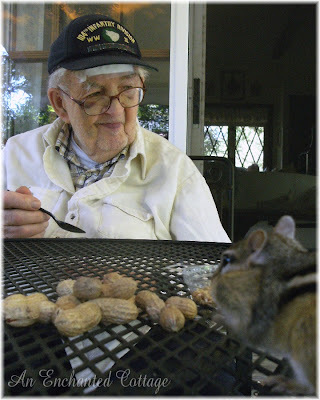 How sweet your Daddy looks feeding that little chipmunk. 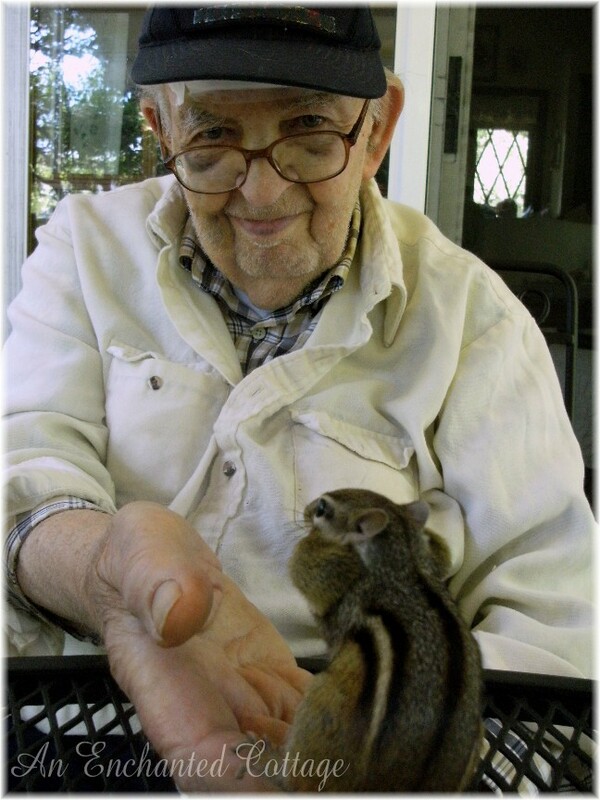 His little cheeks are so full I don't know how he could have possibly held another nut, but he must have loved your sweet Daddy. Precious photos. So precious. Thank you for sharing with me today. Have a gorgeous day sweetie. Your Dad has the sweetest face, Donna! I can just tell what a gentle man he is. 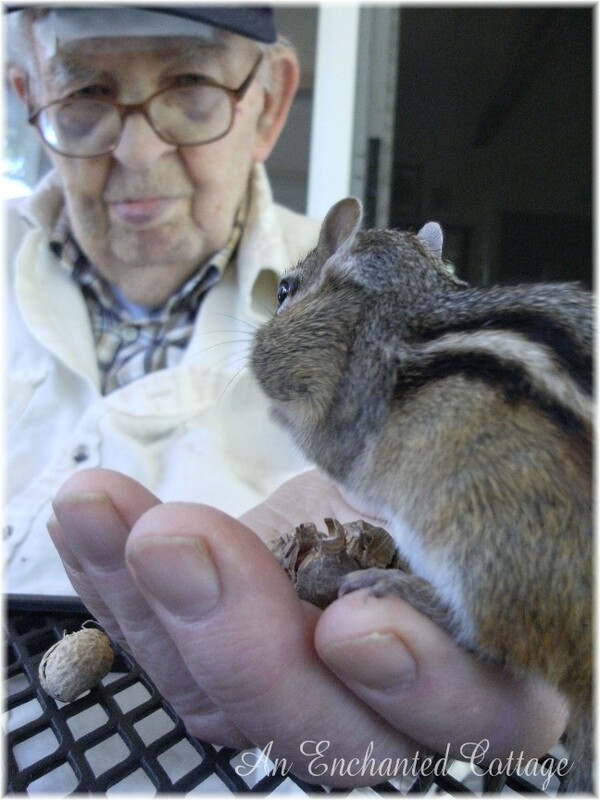 Chips knows an animal lover when he sees one. I love this post. This is just precious...how neat that your dad also enjoys little ones! Love that last photo of your dad. Pure joy on his face. So sweet! Chip is one lucky chipmunk. He gets so much attention from your family. Now I know why you are such an animal lover. You get it from your dad. And I get my love of animals from my mom. How wonderful that you can feed Chip and his buddies! I envy you! Too cute. Looks like you dad is having lots and lots of fun with that little critter. I think the little guy has found a good home. How sweet -- what is it about little creatures that make them so cute? Both of these guys are too cute! Thanks for share these pics and lifting all our lips in smiles. Too cute! super sweet post! enjoy the photos a lot!.. What a sweet picture of your father feeding the little chip. What a great memory to have of your father! How wonderful! You're going to treasure these pictures even more in the years to come. How sweet that is! Your squirrels differ in color and look from our East Texas squirrels. Sweet,sweet pictures! These are definitely keepers for your memory book. These are some of the sweetest pictures I've ever seen. Your dad looks like such a kind and wonderful man. Makes me miss my dad. Honestly Donna...that is the cutest thing I've seen today! I absolutely adore your garden and cottage. It truly IS enchanted. Those pictures with your dad are just precious! Donna, your father's expression is that of pure love and attention to Mr. Chip. The trust that Chip gives to him is precious. Good friends! Oh, how adorable. 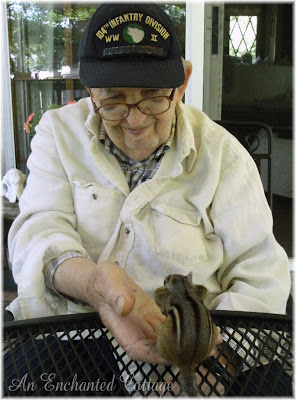 I love to see the soft side of a man with creatures. Oh my goodness. 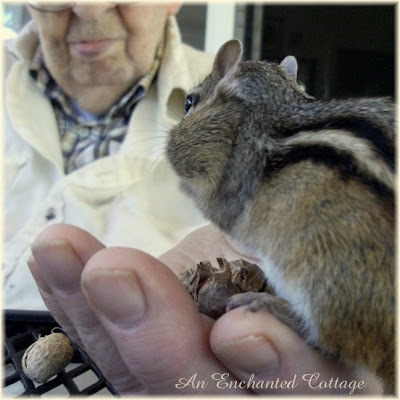 Check out the bulging cheeks on that little fellow (the chipmunk, not your Dad). 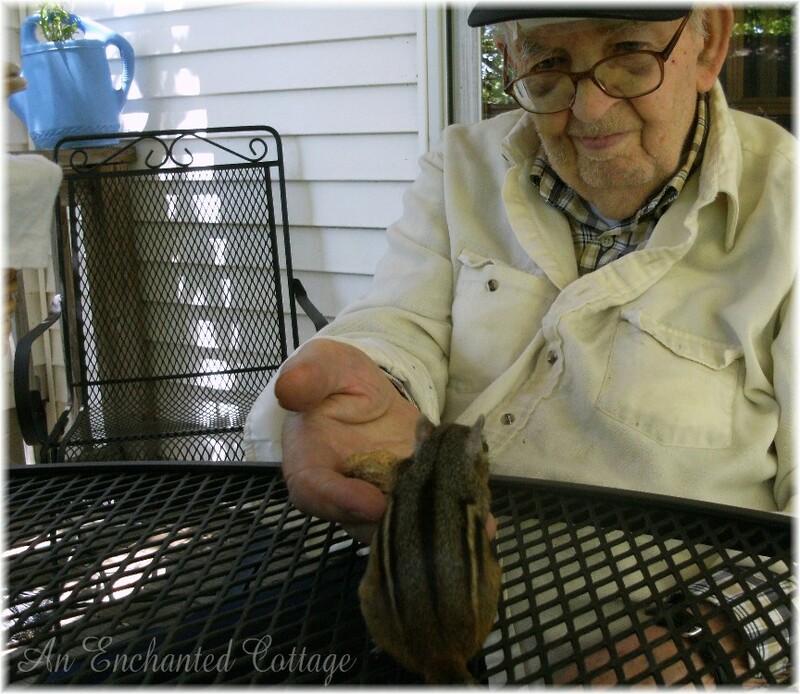 What a blessing to have made friends with a woodland creature, especially one so adorable. I swung by for a peek from A New England Life. We love the little furry creatures too! Too cute! I bet your dad had fun with chip! !